Anyone who is a food blogger knows that you are expected to produce tons of super cute, adorable appropriately themed holiday desserts and treats months before the holiday actually occurs. My first year blogging I had no idea of these expectations and I was wondering why when I posted my Christmas desserts on December 20th (when I would actually make them in real life) no one pinned them or commented on them. It wasn't really until I started networking with other bloggers through Online BlogCon that I realized I was out of the loop. This past Thanksgiving/Christmas season I tried to be ahead of the curve on my holiday themed posts but I still fell way short of my lofty goals to shower you with Christmas dishes from Black Friday to Christmas Day. Now that I am mentally prepared and motivated to inundated you with preciously sweet holiday themed desserts, I realize my other problem. I don't have kids yet and the majority of my blog desserts end up at the fire station where my husband works. And that group of 30-55 year old men don't often request things like Pinterest Pretzel Bites or Homemade Valentines Day Marshmallows covered in Sprinkles (coming soon!) or Leprechaun Bark (coming Feb. 15th!). So I took the easier way out and made you something non-Valentines Day related with a holiday twist. Did you know that if you use heart shaped anything you can automatically call it Valentines Day themed? So I took this advantage to bust out one of my new Christmas presents (thanks, Justin!) Baked Elements: Our 10 Favorite Ingredients the newest cookbook in the Baked Family of Cookbooks . You know I love Snickerdoodle anything so their recipe for Brown Butter Snickerdoodles caught my eye immediately. These are the more labor intensive but infinitely better cousin of the box mix snickerdoodle. As the name suggests, you brown the butter and then you have to bring it back to room temperature before making your dough but it is so worth the extra time. These Snickerdoodles were everything a cookie should be, crispy on the outside and chewy on the inside. The browned butter was the perfect contrast to the sweetness of the brown sugar and cinnamon. Pop a Dove Milk Chocolate Heart on them for the last three minutes of baking and you have a Valentines Day treat that even the manliest fire fighters aren't ashamed to eat. The heart shaped Valentines Day Marshmallows will have to go to the teachers' lounge. In a medium sauce pan, place butter (cubed) and heat on medium heat until the foam subsides and the butter turns brown. Should take between 8-10 minutes. Pour the browned butter through a strainer into the bowl of a stand mixer. Beat on medium to bring back to room temperature, 5-7 minutes. Once butter has cooled, add the sugars (amounts for the dough) and beat on medium for about 2 minutes. Add in egg and milk mixture and beat until fully combined. Add in the rest of the dry ingredients in 3 parts until just combined. Cover dough in plastic wrap and stick in the fridge for at least an hour but not more than 24 hours. Mix the cinnamon and sugar for the rolling mixture in a bowl. Using a cookie scoop or your hands form uniform ball of dough and roll them in the cinnamon sugar mixture before placing on a lined baking sheet. Bake at 400 degrees for 10 minutes or until the tops of the cookies have started to "crack". If you want to add the Dove Hearts, remove the cookies after 8 minute of baking and press the chocolates into the dough and bake for 2 more minutes. Let the cookies and the chocolate cool completely before storing in an airtight container. Love these with the Dove Chocolates! Perfect. I saw these on pinterest, and now here again on Sugar bees linky party. My sister Scary has a thing for dove dark chocolates. I think I feel a care package coming on :) Thanks for the idea! It turned out super cute-and just in time for Valentines day-or a Project Run and play sewing marathon. Either will do! These look delicious Kaylee! Visiting from Life After Laundry Blog Hop! I love this! 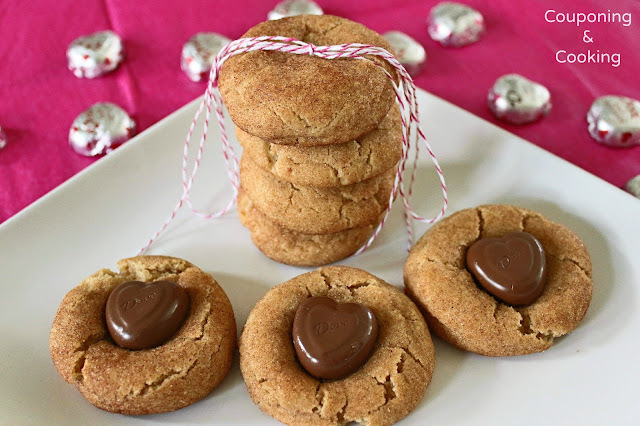 Snickerdoodles are a favorite here, and the heart-shaped chocolate in the center is perfect for Valentine's Day. I may make these for my daughter's class at school. Thanks for sharing! I want some Kaylee!! They look sooooo good! I want 3 cookies RIGHT NOW!!! YUMMY! I love Snickerdoodles!! These look sooo good!! Coming to you from Wow it Wednesday. Yum! And they look so cute! Thanks so much for sharing at Wednesday's Adorned From Above Blog Hop. 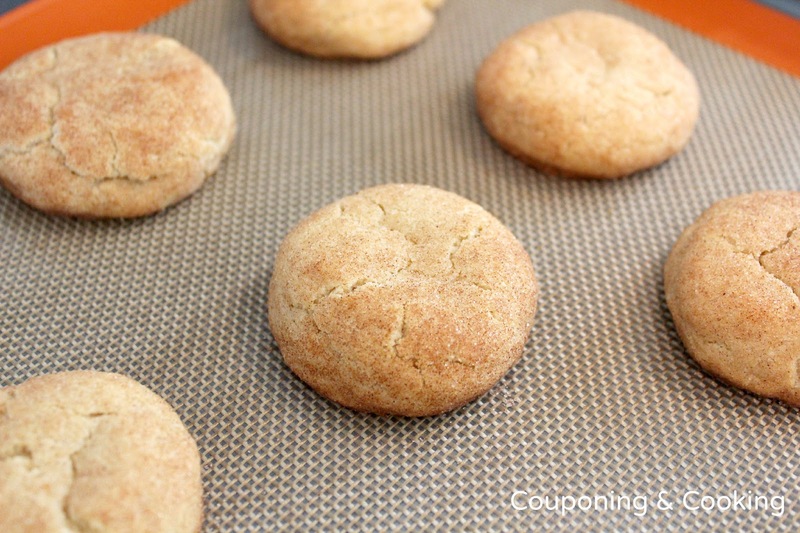 Snickerdoodles with chocolate sound like the perfect cookie to me. The blogging world is crazy like that! I always have lofty goals for how many posts I'm going to get out before the holidays but it takes me so long to photograph and write posts that the holidays are over before I'm done. I'm glad you shared these cookies in time. They look wonderful! Thanks for linking up! These Dove candies make everything a little sweeter. Love that you put them in snickerdoodles!!! I didn't know your hubby is a firefighter-- mine too! And I have the same exact problem... send them something with sprinkles and apparently it's too pretty or girly to eat haha!! Parecem deliciosos e a dica de colocar os pequenos bombons de chocolate fez toda diferença...um charme! Stopping by from Online Blogcon. Cute cookies! I learned that blogging problem the hard way too a few years ago...now I know to be like the magazines and stores and post them as early as you can :-) Love that you put a chocolate heart on a snickerdoodle!!!! So pretty and not too girly at all!! 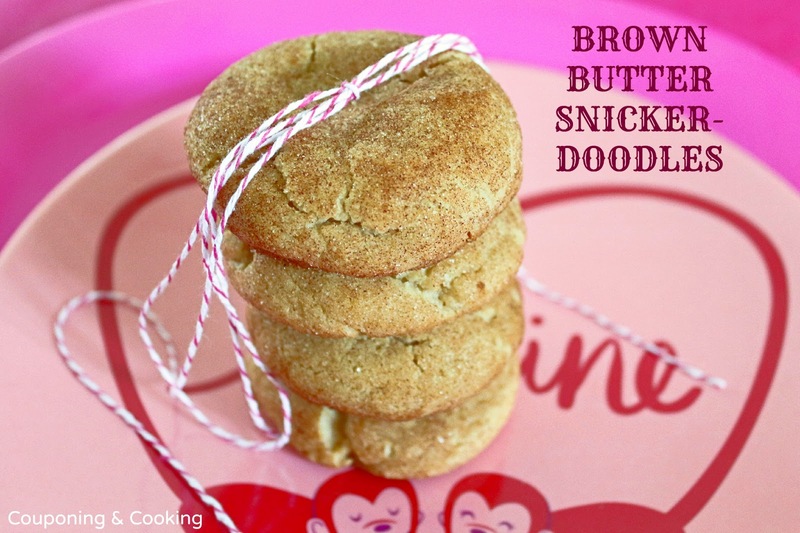 We are Snickerdoodles fans and these look fabulous! Hope you are having a great weekend and thank you so much for sharing your awesome recipe with Full Plate Thursday. Ha ha! So true! Soon as Christmas ended, I was thinking Valentine's day! Life of a blogger! Love the Dove filled cookies! Snickerdoodle is fun, different base for the chocolate! Thanks for sharing at One Creative Weekend! Those look terrific and great pictures! Ohhh these look and sound so good!!!! Love the hearts on top, too!!! I love brown butter cookies...yUM! Snickerdoodles and chocolate.. what could be better. Thanks for sharing on Foodie Friends Friday and I hope you will join us again this week. What's not to love? I love Snickerdoodles just plain. And a little chocolate couldn't hurt! Hopped over from Katherines Corner. Yumm-o!! Love the chocolate heart candy added to the cookies. So fun and delicious! Thanks for linking up to Two Cup Tuesday at Pint Sized Baker . Your post is being featured tonight. Please stop by and link up your new treats from the past week! I am visiting from Time Travel Thursday and knew I had to stop by when I saw the snickerdoodles. 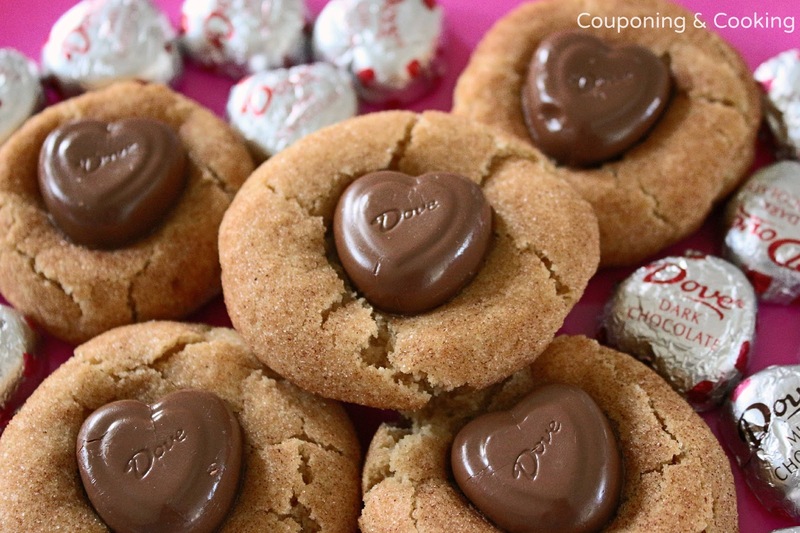 These are my favorite cookie and I love the Valentine's Day twist. I am looking forward to reading more of your posts and am now your newest follower. Please stop by Still Woods Farmhouse for a visit! Wow, what a delightful treat! Yum, I love snickerdoodles! Add dove chocolate and I'm in Heaven. So glad you shared these on my party. Have a great week! I LOVE this idea kaylee - genius! putting chocolate hearts on snickerdoodles. and great pix! Thanks for sharing at the humble brag! Wow these look delicious! I love snickerdoodles and Dove chocolate is a must! Featuring this at the link party tonight! You are way ahead of me! That is the hardest part of blogging! These cookies need to be in my mouth like right now! Love them! Thanks for linking at Show Me Your Plaid Monday's! I am featuring these tomorrow on Made in a Day! See ya there! Oh, my goodness. Those look positively divine! Thanks so much for sharing. I was smiling as I read your post about blogger expectations and time frames. It's like we are even ahead of the Targets and Walmarts in terms of marketing the holidays. With this being my first year of blogging, I am really trying to keep up and not get too behind. I hope you have a wonderful weekend! Oh I am so hungry for cookies right now and these look delicious! Thanks for linking up at The Weekend re-Treat!